Well, since the sailboat is not ready to move aboard and voyage, I have to curb my adventurous desires that seem to always be pulling at me. 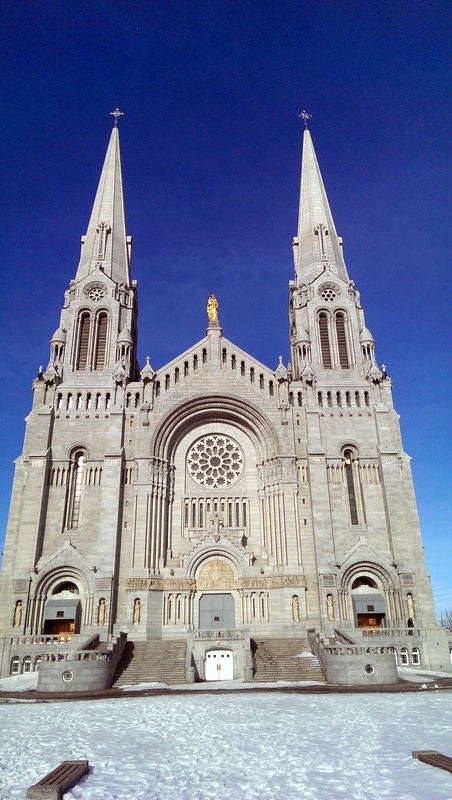 So I looked to the quaint, European-like city of Quebec, Canada! I have been longing to return to this magical city for quite some time. Plus, since Ronnie has never been there and I was also turning 25, I figured it would be the perfect excuse to pull him away from Redemption. After the seven hour car ride from my hometown, we arrived at our hotel, Auberge Place D’Armes (coincidentally, there is also a Place D’Armes in New Orleans). This gem of lodging was perfect, in every way. The hotel sat right across from the magnificent Château Frontenac, just a short walk from the Notre-Dame de Québec church. The receptionist had a warm, inviting smile and the rooms were uniquely furnished each with a gas fireplace that ironically gave us a run for our money trying to turn it on (and yes, I am an engineer). They had complimentary breakfast at the small restaurant that was adjoining the little lobby, which was delightful and very tasty. I could dedicate an entire post describing the room at the Place D’Armes: the heated floor in the bathroom, the soft cotton bed sheets, the view of the Château, the short walk to the lower city by the St. Lawrence River. I thought the hotel room alone made the trip until the next day. 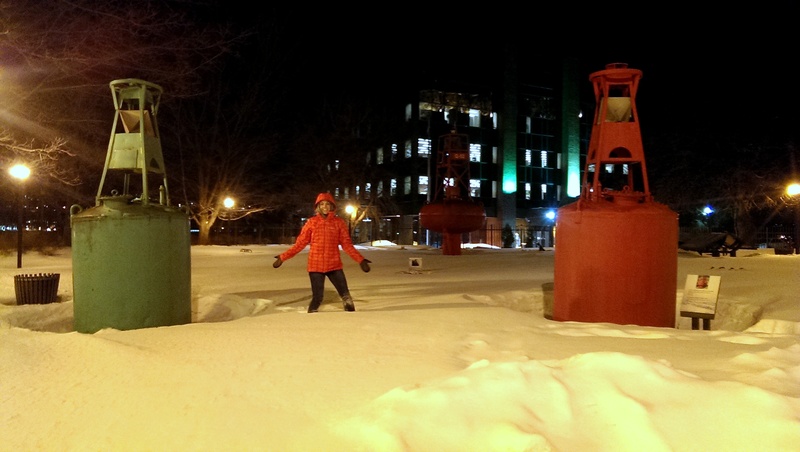 We then explored the city, walking on the icy streets viewing as much as the city could offer us for the first day. The following morning Ronnie and I woke up early to head to the base of Mont Saint Anne. We parked next to the outdoor kennel housing 75 mixed and purebred huskies and malamutes. We were beaming! These huskies were going to take us on our first ever dog sledding experience!!!! Once geared up, we headed down to the Nordic Dog Sledding headquarters where we met Greg, our guide, for the morning. Greg spoke English well and had a delightful French accent. Greg informed us that not only were we going to do something terrifyingly new and exciting, but we were going to do it in a another language. The dogs spoke fluent French, awesome! I wish mine did! The commands were in French. “aller”, (pronounced ah-li) means “go” and with a slight push of the sled and the command “ALLER!” the dogs were off running! If the dogs needed to slow down the word “doux” (pronounced dough) means literally, gentle or soft, would tell the pack to dial the speed down a bit. This was especially useful around some tight turns and around snow banks. Last and certainly not least, some would argue the most important, “whoa’ means stop. Whoa, strangely, seems to be a universal word that means stop no matter who or what you’re talking to. With the commands in the order, we were off to meet our team. And that’s when we met Skimmi! Skimmi was our lead dog of our dog pack. She was a beautiful, Malamute husky with piercing dark eyes and even though she was old and did not run as fast as in her younger years, Skimmi was constantly picking up the slack of the other dogs. The other dogs, each with their own unique personalities, were quite comical and cute to watch. Each personality of the dog presented itself as the trip went on, but we quickly met the few ‘pissers.’ Since it was the first run of the morning, Greg informed us that there will be some frequent stopping in the beginning for the dogs to do their business. Greg then proceeded to tell us that once the majority of the dogs did their business, we were not to stop for the dogs anymore. There were two dogs on the team that if given the chance would have peed on every single tree, rock, or leaf on the mountain. What a riot it was to watch these frequent urinators! The thrill of dog sledding was truly exhilarating. 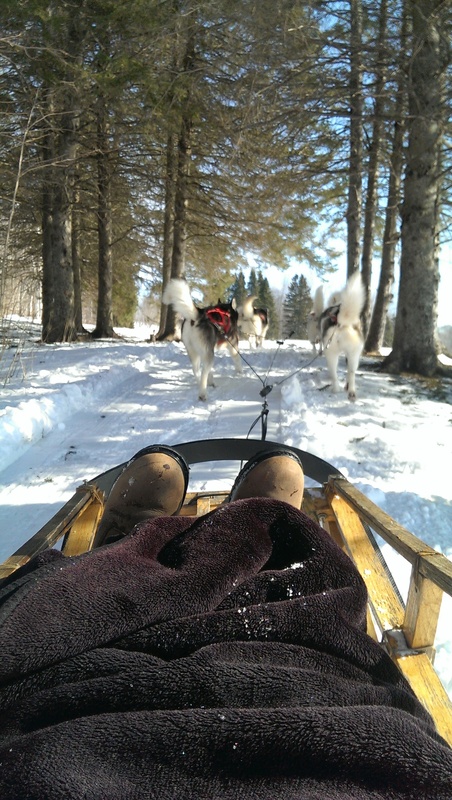 The speed of the dogs maneuvering the windy trails, and the sound of the sled rubbing up against tree trunks (yeah we were not great drivers, it was our first time!) gave Ronnie and I the biggest smile that we couldn’t wipe off our faces for the rest of the day. Everything about the experience was captivating! It definitely is a workout. We both worked up quite a sweat driving the sled, but working with the dogs and being in nature makes it for a once in a lifetime experience we won’t soon forget. If you ever find yourself in the opportunity to go dog sledding, whether at the Nordic Adventures of Monte Saint Anne or anywhere else please do not think twice about it, just go do it! Even though dog sledding would be more than enough activity for most anyone in one day, we were ready for more. However, when it comes to planning a vacation, I tend to make the most out of every day. When I say I make the most out of it, I really mean you better have a smile on your face at seven in the morning, because we are booked solid till eight at night. (As a side note, quite a few times, I have said “I need a vacation from my vacation”). As I was saying, I tend to pack as much as I can when I can. Well, since dog sledding was conveniently located at the base of Monte Saint Anne, we could simply not pass up skiing/snowboarding the afternoon away on Anne’s crystal, white slopes. We purchased our tickets, Ronnie got outfitted in some sweet snowboard gear, and I had my week old pair of skis, we were ready! 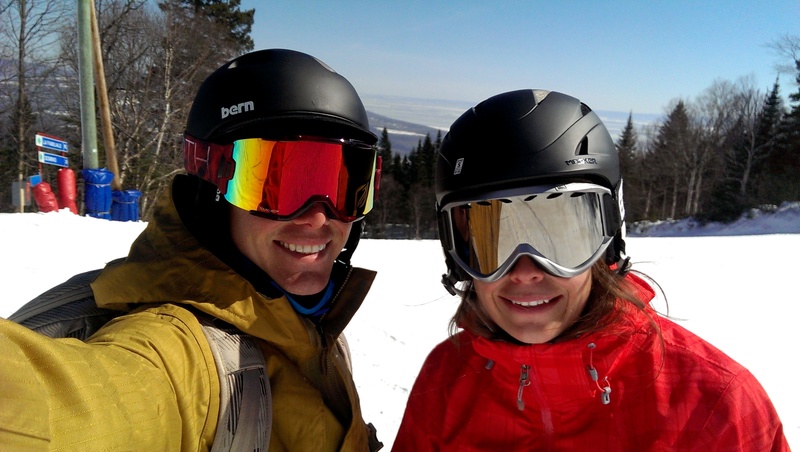 We looked the part of typical ski bums, but were we? Absolutely not, we were quite the opposite actually. Ronnie living just outside of New Orleans rarely encounters snow. He has been snowboarding less than five times when I meet him. However, he was more comfortable on the slopes than me. Ronnie was an avid wakeborder in high school and college, and goes when he can now lately, which made him look like such a natural on the slopes. This absolutely irritated me the first time we met! Here I am, born and raised in the North East, where I embrace the cold, bitterness of winter while the southerners bundle up if it drops below sixty degrees. I should totally have been able to outride him and show him how not to be afraid of the snow. After a few runs though, I quickly warmed up and we were neck in neck racing down the mountain. Our favorite run of the day known as the Enchanted Forest, and is located on the backside of the mountain. It is marked as a green circle glade, and what a fun trail! I think anyone of any ski level would enjoy this trail. It starts out completely harmless, you find yourself staring at cuddly, cartoon animal cut outs nailed to trees. They are simply hanging out, and laughing… Laughing at you not with you, which we soon found out. Right behind the hippo (I have no idea what this hippo is doing in Canada), comes the warning sign: “Caution! Potential to Snap Skis.” This is where the forest gets a little more enchanted. The harmless dips turn into a giant’s staircase with huge rollers of snow, which only leads to your inevitable demise. Don’t worry, the trees are spread out and there is plenty of snow on the side lines to bail into when things get a little out of control. Even though each run of the Enchanted Forest ended in a crash (or three) for both of us, we had a blast. Monte Saint Anne is pristine, though not as tall as the Rocky Mountains, but tall enough with plenty of trails to keep every skier happy during a vacation. We would definitely recommend a trip up here if you ever find yourself up the St. Lawrence River looking for some mountain time. The remaining days were spent meandering about the city and the riverfront. 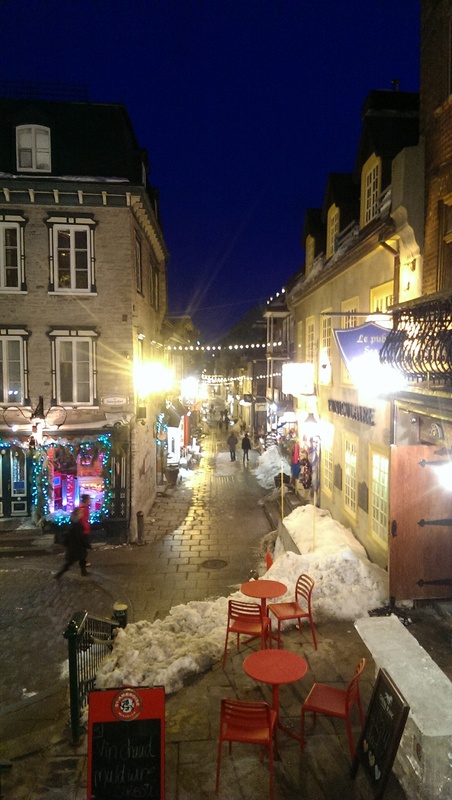 The streets really become pretty when the sun goes down and the snowy cobble stone streets glow in the city lights. 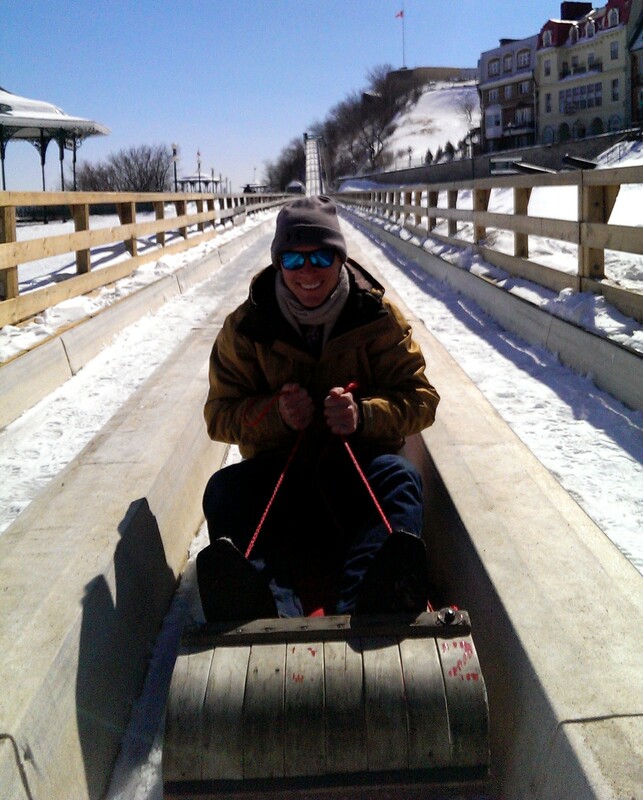 Ronnie went on a toboggan ride at the base of the Château, his first one ever. 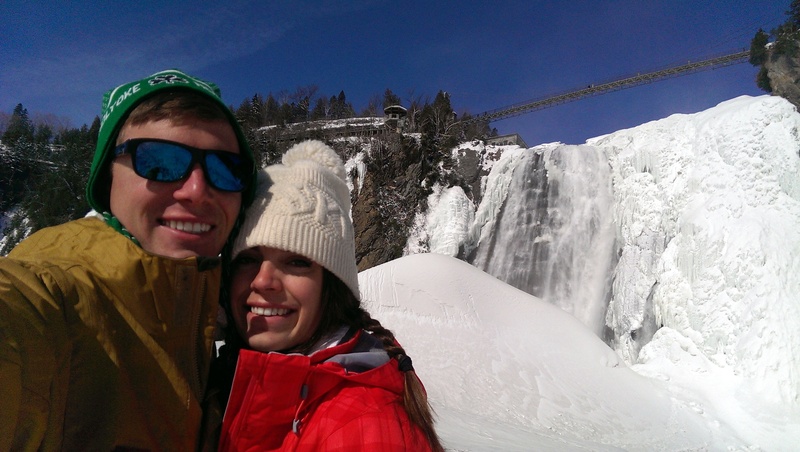 We walked up to the base of Montmorency Falls just outside the city, well we kinda snuck over to it by hiking on the frozen river bank. 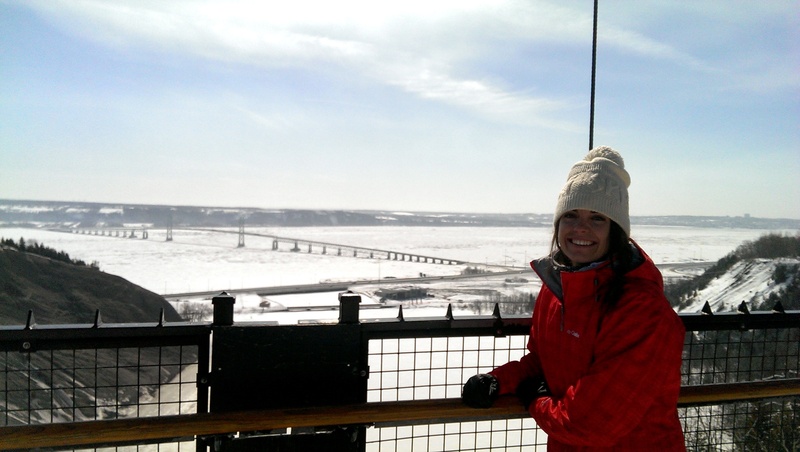 Then we hiked over the falls which was such a stunning view of the St. Lawrence river and Quebec City in the background. 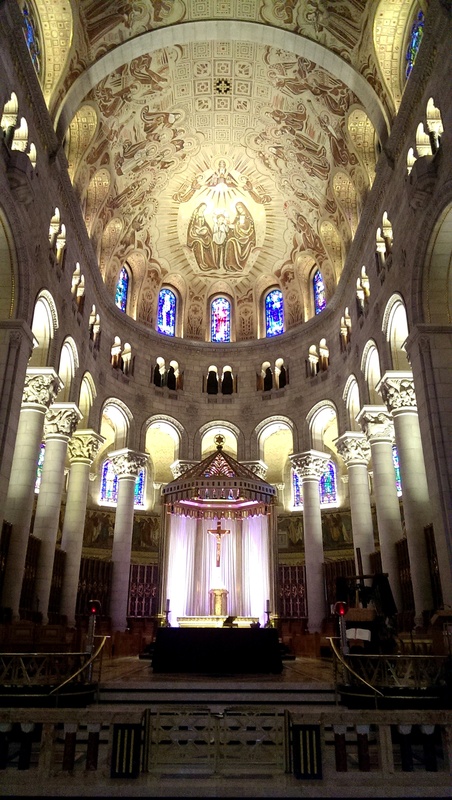 After, we visited the Basilica of Sainte-Anne-de-Beaupré where many miracles have happened where the sick were heals and the crippled walked. 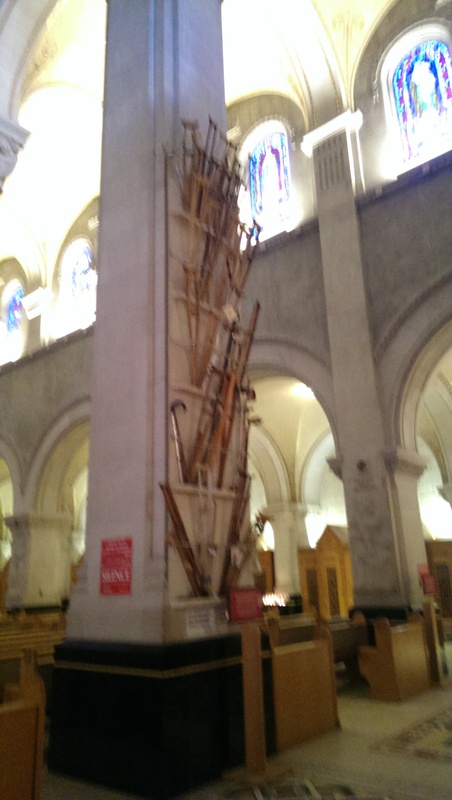 There is a column inside that has crutches hanging where those who couldn’t walk were healed by the power of Jesus Christ! It was a beautiful church to say the least, and it had such a reverent aurora where you could just feel the presence of God. 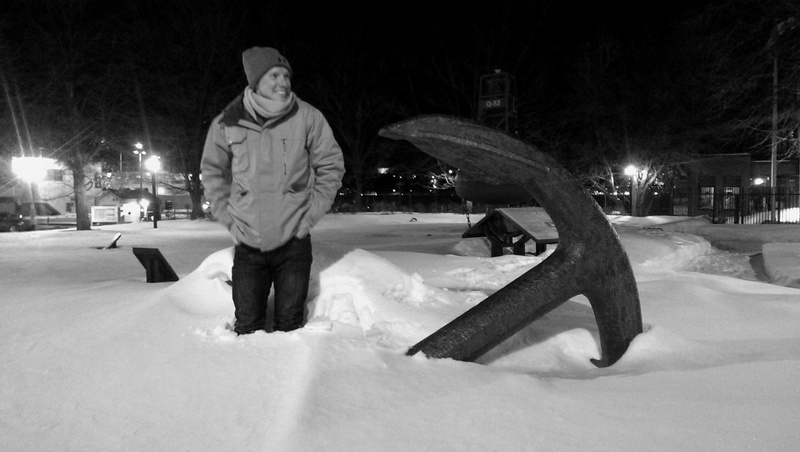 I think we would definitely visit again, and we have discussed sailing there via the St. Lawrence in the future. It is one unique city that has a cute quaintness to it but is such a lively and wonderful place with warm, friendly people. Work flow: What do our props look like?